My husband is a story teller and I want to share one of my favorites of his stories. I won’t do it justice, it is best when he tells it but I’ll do my best. He was a chaplain with the Infantry and tromping through the jungles in Peru with the 101st Airborne Division. They came to a place where they had to be transported in small crafts across a fishing bay and his skiff, with the officers of course, had a guide. The translator kept eyeing Joe. Later, he realized it must have been the cross on his uniform that indicated he was a priest. “Cristo esta en el agua!” the man said to Joe, “Cristo esta en el agua!” Joe’s Spanish was almost as bad as mine at the time but he tried to make out what the man was saying. Cristo esta en el agua! Joe gave the universal shrug and blank face and nodded that he wasn’t sure. Then the guide pointed at the water. They were almost upon the harbor where they would disembark. Joe looked over the side. The guide pointed excitedly for Joe to look into the water. There, under the bay, deep in the water was a huge statue of Jesus in orans position. It looked like the famous Christ the Redeemer statue of Jesus in Rio de Janeiro, only a bit smaller. The statue is there to bless the fishing vessels as they go out to sea in hopes of an abundant harvest. Joe thanked the guide and was moved by the very idea of Christ in the water. Cristo esta en el agua! Christ is in the water. I hope everyone has enjoyed the holiday this week. Our Thanksgiving holiday consisted not of turkey and all the trimmings, but we did stream lots of TV series shows. It was a binge on the familiar theme - holiday brings family together, conflict ensues, comedy follows, then some sort of reconciliation and often some tears. There is another theme I noticed this year, the theme of overdoing tradition. Many holiday comedies have been founded on this theme. The family must do that thing - a game, or recipe, or particular hike or article of clothing - or it’s just not Thanksgiving, or it’s just not Christmas if we don’t keep all those traditions. Joe and I watched one such episode of a family situation drama series in which a 30-something couple, newly dating invited each other home for the holidays. She is Jewish so he gets to hear all about the Maccabees defeating the Greeks and his family is not religious but “culturally Christian” it seemed to me. That is to say he is of that ilk which still puts up a tree and a creche’ even though no one really knows what these items mean. You know, it’s just because that what we’ve always done. He takes her to his family gathering and tries to explain the nativity set and fails ridiculously. It’s funny. And it’s sad. Today, in a rare opportunity, we will celebrate the Church’s two great sacraments. The challenges in today’s readings are about two things that sometimes make us uncomfortable: Resurrection and Christ as King. Maybe that’s not true. Many of us find these theological concepts just fact. “This is true and I believe it and there is no question.” And that’s awesome. Others of us struggle with the very concept of resurrection. A mentor and priest got me to realize that I was denying my own discomfort with the resurrection. He said, you can’t have Christianity without the resurrection. I wanted to just focus on the incarnation - that Jesus was fully God and came to earth and taught us some really good stuff about love and that’s enough. But my friend is right. Jesus is not just a prophet, an historical figure, who taught some wisdom and then was martyred. He did rise from the dead and ascend and so we must speak of him in present tense, not past. Most of us just want to have a personal relationship with Jesus whether we see him as past, present, or future. We just want a friend and we do have a friend in Jesus, as the hymn goes. But we must face those parts of the story, those Christian Doctrines that cause us pause. And today, by participating in the Baptism of these children, we get the chance to practice that. Here and now we can practice resurrection and we can realize Christ as our King. Because we become one with Christ in our baptism, we become a part of the promise of our own resurrection and Christ is our only king. 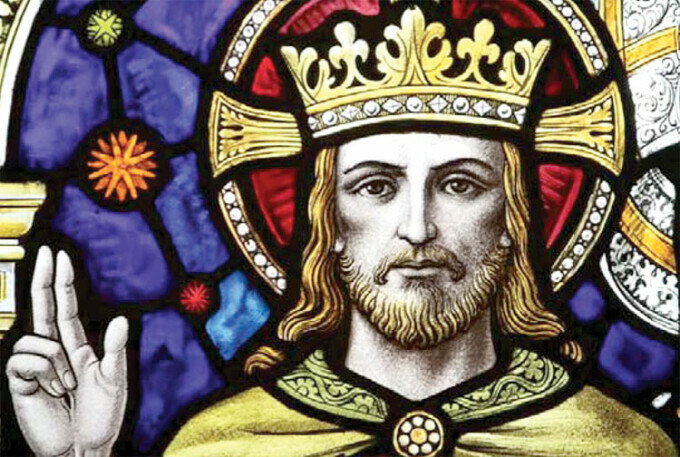 Christ the King is a relatively recent feast in the liturgical calendar. Pope Pius the XI instituted this feast (or solemnity if you want a more accurate term) in 1925 in response to a certain growing nationalism and secularism. This period in world history was between World War I and The Great Depression and just prior to the making of the Vatican as an independent City in 1929. There was much debate at this time about who was in charge. For you history buffs, this particular argument was called The Roman Question and it was a big argument, involving mostly Italy but also France. It was all about who was, essentially, King. Until 1929, Popes had always acted as secular governors as well as the See of Rome, but just prior to this era the Catholic church began to realize a need to return to more spiritual matters. When the debate was settled, Pope Pius the XI created a new holy day - or holiday as the word has become – for celebrating Christ as the only King. The problem with Christ as King is, I think, more difficult for us 21st century Americans. We Americans don’t like kings. Not since George the Third. The guy we defected from in the Revolutionary War. We don’t like kings. We like heroes. We want Jesus to be our hero, to make us feel safe and loved. But that is not what being a Christian through Baptism is really all about. In fact, I think we sometimes need a recharge on our treatment of all things sacramental. We do love to make our communion at least once a week. Of course, that’s preaching to the choir as it were. We are here, us regulars. But nearly half of Episcopalians do not make their communion regularly. What’s up with that? We just had this huge celebration of Thanksgiving, but the very word Eucharist means just that - Thanksgiving. But many have come to either take it for granted or just feel it is not necessary. We can be, we are told, the missional church without all this ritual and expensive beauty. Let’ just meet in a coffee shop and do good works. I don’t agree. Baptism is in worse shape as a sacrament. I am afraid that it has become a ritual of celebrating the birth of babies. And, well, that is like the best thing to celebrate! These beautiful babies that have come to be a part of this community are certainly worth celebrating. So we enjoy the part of christening gowns and candles and laughter, even when they cry about getting wet. This is all wonderful and I wouldn’t dare suggest we change it. What may be missing, however, is remembering what Baptism really means. And, I’m not suggesting that we gathered here don’t already know this. Again, I am preaching to the choir. But it is worth reviewing. The prayer book asks us to renew our own baptismal vows and join the newly baptized in our vows - as a community. Will you do all in your power to support these persons in their life in Christ? … continue in the apostles’ teaching and fellowship, in the breaking of the bread, and in the prayers? … persevere in resisting evil, and, whenever you fall into sin, repent and return to the Lord? … proclaim by word and example the Good News of God in Christ? … seek and serve Christ in all persons, loving your neighbor as yourself? … respect the dignity of every human being? Of course we will, with God’s help anyway. We answer eagerly, enthusiastically. And then we leave and ... well, I wonder if we take all that with us and actually practice it. It seems to me, that at this point in time in the Church, and I mean the whole Church, that we have really taken seriously the command for us to follow the risen Christ by feeding the hungry, caring for the poor, the meek, the widows and orphans and we do really want to “respect the dignity of every human being.” We really have gotten better at our outreach, at being the church, the missional church. This is wonderful. But it seems to me we may be throwing out the baby with the baptismal font if we are not doing this from the foundation of a sacramental practice. Loving our neighbors as ourselves includes, according to our baptismal vows, doing so by seeking and serving Christ in all persons. How can we do that if we are not practicing a sacramental devotion to the Christ that is within us first? Holy Eucharist and Holy Baptism are the sacramental practices that define who we are. We are marked as Christ’s own. Forever. Otherwise we are just “a noisy gong or a clanging cymbal” as Paul put it. Of course that is a quote from 1 Corinthians 13 where Paul was talking about acting all holy up in here and not loving our neighbors. Apparently that is or was at times an error in the Church. But, what about the possibility that we may err in the opposite direction? If we were to love our neighbor and not pray as a community? Love, but not eat and drink of Christ at one table together. Love others, but not really take the waters and blessing of Baptism seriously. We will begin a new Christian calendar year next week with Advent. I invite you to consider the importance of practicing the sacraments together weekly this year. And, as I said, I’m preaching to the choir so I ask you to invite our absent brothers and sisters in Christ to return to regular times of worship and prayer so that we can be the church as a full community.